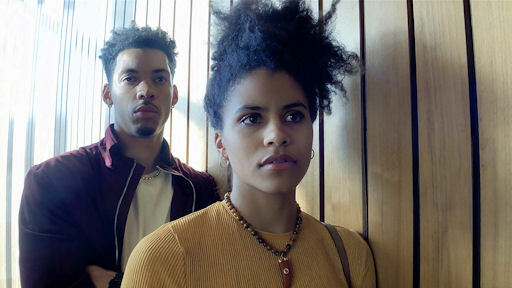 Review: High Flying Bird / It's Just Movies Review: "High Flying Bird"
Professional sports have reached a point of almost religious sanctity, and dogma, all over the world. As expected, the money changing hands leads to corruption, major or minor, in almost every league. Director Steven Soderbergh fit right into this film, since the modern American National Basketball Association is a company town. Once gifted athletes sign on the bottom line, the NBA holds all the cards. This is not a story of disruption, it is a mutiny. The only reason the company town survived, and the pro athletic leagues continue to financially enslave their players, is that the victims are denied the tools to think outside the box. Put talented people in a position where they are controlled by laws they did not make, do not understand (who does?) and have no ability to change, and the establishment has a money tree. This is the story about players who planted a new tree. Screenwriter Tarell Alvin McCraney showed what he knew about being locked out with his 2016 Oscar winning “Moonlight” screenplay. Meeting up with Soderbergh, the two talked about a project on the economics of pro sports and McCraney steered the context to the 2011 NBA lockout. The lockout is a time-honored legal tool used by business owners from mining to manufacturing to the arts to hurt rancorous workers. Owners have savings, investments and, most importantly, credit and access to loans. If workers are kept in marginal financial straits, depriving them of work hurts the workers more than the owners by depriving them of food and shelter in short order. This movie explores what might happen if locked out athletes pulled an end run around their legal straight jacket and invented a new sport to keep them solvent during a lock out. Are owners protected ten ways from such a mutinous move? You bet they are. Still, it just might work, especially if the public is brought into the act. An elegant and seditious work, a film about athletes that refuses to entertain with athletics, this is the kind of thing for which art is made. It is not just about a particular gambit in a particular situation, it is about realizing one’s self worth, and the power of unity. 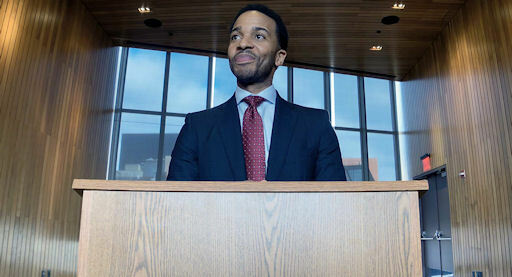 Andre Holland plays Ray Burk, a sports agent caught in the middle of a lockout with his client, No. 1 draft pick Erick Scott (Melvin Gregg). Erick has just achieved the American Dream, signing with an NBA team, and is immediately facing bankruptcy due to the lockout. Think “Harlem Globetrotters” and the “game on top of the game.” If they can operate outside the NBA abut presenting basketball in a different format, maybe there are other formats that would work like that. What would happen if the factory town learned programming and wrote mining software?